banana leaves recipe collection. 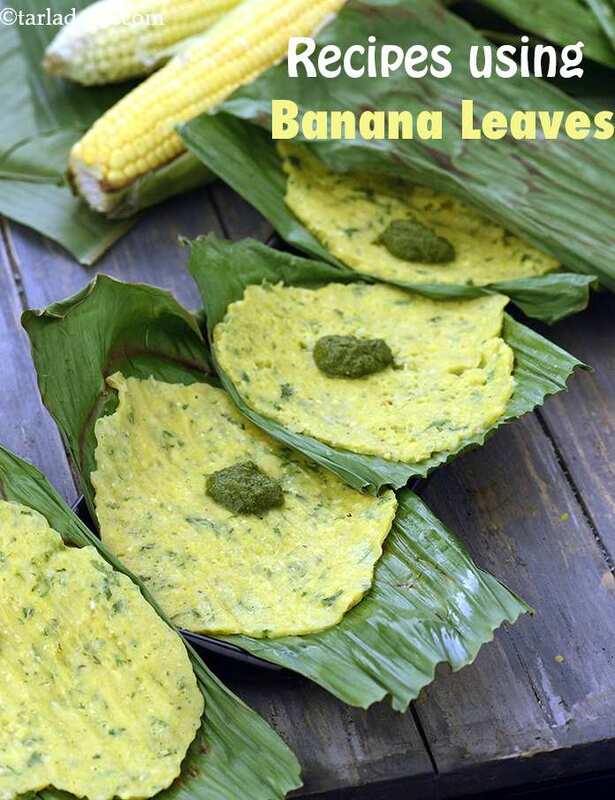 Indian banana leaves recipes. As the name suggests, these leaves are obtained from the Banana Plants. The leaves are bright to dark green in color and are really large and wide in shape. The leaf holds major significance in a lot of religious functions and pujas. Moreover they are also used as decoration, or as plates and bowls especially in the Southern India as they are considered to be pure. These leaves are widely used in many Asian countries for cooking, like Thai, Singaporean, Sri Lankan etc. Since banana leaves are clean, chemical free and edible, they are used in cooking. Food can be grilled, steamed and deep fried in them, all you have to do is wrap the food in them. Even the Gujaratis use banana leaves for cooking. Panki, a traditional Gujarati Rice flour snack, is made by two methods combined. The savory rice batter is spread between the leaves and then the leaves are kept over a hot pan till the panki is cooked. Panki can have many variations like corn panki or green peas panki. The advantage of cooking in banana leaves is that it packs all the flavor in the food without letting any of it get out. That is why a lot of rice dishes are cooked in it to pack in the flavor. Rice and Curry in Banana Leaf is a unique recipe where a tangy creamy curry is steamed together with rice to get an irresistible combination. Moreover, because of the size of these leaves, they are used as plates to eat rasam rice or even dosa! If you want to know more about the Uses of Banana Leaves, then you can check out our article on that. Enjoy our banana leaves recipe collection. Indian banana leaves recipes collection below. Green pea panki is a popular Gujarati snack made of a rice flour batter that is cooked between 2 banana leaves. Green peas added to the panki batter make it look more appealing and enhance its fibre value. Serve these steamed hot pankis with green chutney. Small rice pancakes steamed in-between banana leaves makes a great snack. The microwave version of the panki uses less oil compared to the conventional cooking method. Rasgulla rolls interlaced with sandesh and attractively presented in banana leaf boats. Were you thinking that traditional foods can be made only with kadhais and tavas? pankis can be made quite swiftly in the Microwave too. Here is how! but, ensure you spread the batter very thinly for fine results. Rice panki, steam rice flour pancakes between banana leaves, and serve this farsaan to steal a gujarati’s heart! urad dal flour helps to bind the panki batter and make very thin pankis. Serve the pankis hot from the griddle, with spicy green chutney and butter. The fragrance of basil, tartness of lemon and soothing coconut milk flavors all go into to making this recipe a super success. Infused with Thai flavors, the rice is mixed with red Thai curry ingredients and cooked first, before being sealed inside a banana leaf and steamed once again. Delicious! A wonderful snack to make when corn is in season. While the coriander and green chillies pep up the panki, the innate flavour is heightened by cooking it wrapped in banana leaves. Serve fresh and hot.